Just before my mother became pregnant with me, she voted for the first time. This wasn’t because she was a bad citizen, or because she was so young that it was the first time she could have voted (although, given the laws of the time, that was also true). It was because May 2, 1962, was the first time Bahamian women ever voted. My mother voted only once in that election, in the Eastern District. My grandmother voted twice: once where she lived, and once (I’m guessing) also in the Eastern District, where she owned property. I don’t know who either of them voted for. I’m not sure whether Delancey Town, which was where my grandmother lived at that time, was part of Nassau City or part of New Providence West. If the latter, her choices would have included Paul Adderley and Milo Butler; if the former, Stafford Sands and Raymond Sawyer. In the Eastern District, the choices included Arthur Hanna and Geoffrey Johnstone. What choices those women made is beyond me now. My mother only ever revealed how she used her vote once; that was much later, when we were both grown women. My grandmother, on the other hand, was both a suffragette and an early supporter of the Progressive Liberal Party, so I can guess how she voted in 1962. We all know what happened, though: women were added to the register for the first time, and the status quo (the UBP) was re-elected, by a landslide, to parliament. And so in March 1963 I was born into a Bahamas that was a colony still run by white Bahamians, and which still practised segregation in private places, even though the House of Assembly had passed a resolution in January 1956 stating “that discrimination in hotels, theatres and other places in the Colony against persons on account of their race or colour is not in the public interest.” There were many places people of colour did not go, and several places where they still could not. So even though the inclusion of women on the register did not change the government immediately, the issues that faced the majority of Bahamians had not changed very much. The changes that were coming were, when I was born, coming incrementally, or so it appeared. The things that happened during my very early years were momentous, though I didn’t know it then. The first, though I was not old enough to notice it, was that in 1964 the Bahamian colony was granted internal self-rule. This would involve the institution of principles such as universal adult suffrage, one man/one vote, single-day elections, single-representative constituencies, a Cabinet of Ministers with specific portfolios, and a Premier. With this came our first written constitution, which was celebrated by a Royal Visit and a public holiday, neither of which I remember. The second one related to our money. In 1966, we shifted from pounds sterling to the Bahamian dollar. When I was a little child, we were still using British money as our major currency: people counted in pounds, shillings and pence. Pennies were huge round copper things, bigger than any of the other coins that people used; sixpences were small (if I’m not mistaken, around the same size as an American dime). Ha’pennies were of a size with today’s Bahamian one-cent pieces and farthings were even smaller. 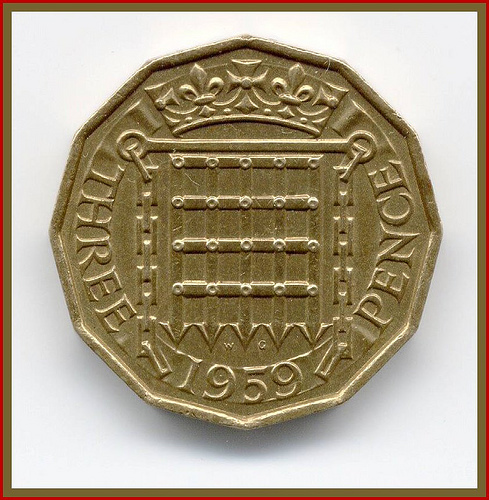 But what I remember most were the threepenny pieces, which we called thruppence: thick, heavy, with (now I look on the internet to find out) twelve edges. The change to the dollar happened when I was three, which may be why I remember the money so well: we were given it to play with after it had lost its value. As for January 10, 1967: we were living in Shirlea then, down a cul-de-sac of houses inhabited by hard-working migrants to Nassau from the out islands. Most of them were light-complexioned. Many considered themselves white, though the people who were running the colony at that time may not have agreed with them. The neighbourhood was the kind of place where tiny children, of which I was one, could wander about without being run down by cars or kidnapped by the maladjusted, because I remember wandering around as far as one of the stop signs that we had in the neighbourhood. There, where the word STOP was painted in white, someone had spray-painted the initials “UBP”. There was no doubt which candidate our neighbours were going to support. I don’t think he won, though. According to the Wikipedia page, the candidate who won in our constituency was the ill-fated Uriah McPhee, whose death one year later would lead to to the calling of the general election that changed the country for good. I don’t remember the 1968 election. I do remember some of its effects, though. By that time we had moved out of Nassau to what was then the “country”—a stone house at the top of Johnson Road, which my parents bought in 1967, in that wild time that followed majority rule. The people who owned it were moving out of the neighbourhood. It was a time, I believe, when property values plummetted; in the shock that succeeded the PLP victory at the polls, some white Bahamians and several expatriate residents left the country. Homes that would otherwise have been far beyond the reach of ordinary Bahamian families were suddenly, and for a short window of time, affordable, and my family made the most of that fact. When we first moved into Glengarriff Gardens, I don’t remember any other black children around us. All our neighbours were white, most of them immigrants from Britain. Over the next ten years, though, as we moved towards independence, other black Bahamian families moved in around us until, by the time I was in high school, the neighbourhood had become quietly mixed. That year, 1968, my father became the deputy headmaster of a brand-new school. The school was called Highbury High and there was something exciting about it. What I didn’t know then was that it was one of a set of brand-new public schools opening throughout the country, part of the commitment of the new PLP government to make it possible for all Bahamians to have access to secondary schooling. Secondary education was something that had been limited to the gifted, the middle class, or the white to this point, but in 1968 that began to change. Highbury High was situated on Robinson Road. I visited my father there once or twice, and remember thinking that there was a marked similarity between the girls’ uniforms and the uniforms worn by servers at Kentucky Fried Chicken: the red and white stripes looked eerily familiar to me. My father’s immediate boss was the late Juanita Butler, who was the Headmistress of the school, and his senior master, who later became Deputy Head after my father moved into the Ministry of Education, was Winston Saunders. The school, in case you haven’t guessed yet, is what we now call R. M. Bailey. In the beginning it was simply a high school, a school that taught children and young adults between the ages of 11 and 16. My father didn’t stay there long; after that first year, the Ministry called him to HQ to work as the Cultural Affairs Officer. But his connection with Highbury High would last his lifetime. Some of first crop of teachers who helped to found and build the school—among them Winston Saunders, among them the British transplant Stuart Glasby—would become my father’s dearest friends, adopted members of our extended family. I remember a couple of things about 1968, The first had something to do with San Salvador. For reasons that are only becoming clear to me as I write this, we spent the summer there. There was a branch of the Bahamas Teachers’ College there, and my father went there, to teach music, I believed. For us children, that meant we spent afternoons with our mother on the beach, where my father would come and join us around 2 PM. But at the same time, I’m realizing that there was something else going on. That year, the Bahamian government had been invited to take part in the cultural activities that accompanied the Mexican Olympics. Mexico was the first Latin American country to host the Olympic Games, and it chose to commemorate that fact by sending the Olympic Flame on that same route that Columbus took on his journey into the Americas. As Guanahani, San Salvador was the first stop for the flame after it crossed the Atlantic. The Mexican government gifted San Salvador with a monument which would display the flame when it arrived. The photo above shows my father in front of that monument with the Olympic flame burning behind him. I don’t remember either the monument or the flame being in place when we were in San Salvador, but I now suspect that part of my father’s task in being there was to identify the site, meet with officials, and coordinate with the Mexicans to help receive the gift. My father also composed the score for The Legend of Sammie Swain during 1968. I want to say he did it during that summer, but I honestly don’t know when he did it; I do remember, though, that it seemed he sat at his piano all hours of the day and night. I also remember that he grew his trademark beard in the process, as he was too busy composing to shave, and he liked the result so much it is how we all remember him to this day. In the photograph he has the beard, so Sammie Swain would have been written before that. The score was part of our contribution to the Mexican Cultural Olympics. It accompanied a ballet choreographed by the Russian-Mexican dancer Alex Zybine, who was then living in Nassau, running the Nassau Civic Ballet on behalf of the Bahamian dancer Hubert Farrington. Farrington and Zybine had met one another while dancing for the New York Metropolitan Opera, and Farrington engaged Zybine and his wife Violette to run his ballet school in Nassau until he came home. Mrs. Zybine was my ballet teacher, and I loved her; we did ballet and a little yoga, learned positions and extensions, and practised stretching ourselves, dying to be big girls old enough to go up on pointe. My father took the story of Sammie Swain from a folk tale serialized in the Tribune by Etienne Dupuch, and Alex created the very first choreography for the tale. The ballet was in its own way unique, as my father’s music was choral rather than symphonic, and the story was narrated from the pit. And I remember the moment I first watched the ballet. It may have been the next year, or the year after that; it was almost certainly after the Mexican trip, when Bahamian summers became defined by an annual Folklore Show, a series of performances that took place on Thursday nights in the Government High School Auditorium, featuring young black Bahamians, dancers, singers and actors, performing our culture–our culture, which we weren’t supposed to have–every week for us to look at and feel proud about. Sammie Swain had me transfixed, and the music has been in my head ever since. I was born in a colony that had no room for the vast majority of its subjects. I was born at a time when my family, which was called “brown” or “high-yellow”, could go only so far but no further. I was born at a time when half of my heritage was assumed to be savage, to be unable to comprehend or appreciate “fine” culture, when I was expected to gravitate towards the other half of my heritage, which represented civilization, development and progress. But before I was seven years old, much of that had changed. I don’t have to remember what Doris Johnson called the Quiet Revolution specifically; though I was too young to have experienced the segregated world this country was founded on, the change, even at the beginning of my life, was clear. Bahamian folklore group leaving for Mexico, 1968. Clement Bethel at the back in a blue jacket. Alex Zybine in the front sitting on the Pan Am bag. Wonderful! You have a way of bringing history to life..I too remember people calling RM Bailey, Highbury High…..I don’t remember the old English currency, but my parents spoke fondly of them. I look forward to more from your blog.